Banana Coast, the new Western Caribbean cruise port at Trujillo, Honduras, hosted its first cruise ship on Feb. 10 when Travel Dynamics International’s 130-passenger Yorktown visited. 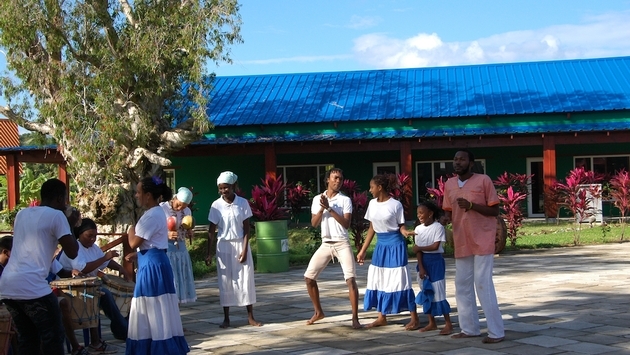 Passengers tendered to shore and were welcomed by Garifuna musicians playing the unique style of the Central American music. They shopped for locally made crafts, went on tours to the nearby rainforest and relaxed on the beach. “It was rewarding to see Banana Coast come to life today with its first cruise passengers,” said Randy Jorgensen, general manager of Grande Trujillo Authoridad, which developed the port. Banana Coast has shopping, a newly built tender dock, a reception center and transportation hub and 10 acres of beachfront in the town of Trujillo, which was established in 1525. To date, five cruise lines have scheduled 20 calls on eight ships at the first cruise destination on the Honduras mainland. The Honduran island of Roatan, a frequent port of call on cruises, is about 32 miles north. Holland America Line has committed to a series of port calls to Banana Coast beginning in November through March 2015. Silversea Cruises has scheduled calls in December 2014 and March 2015. P&O Cruises and Oceania Cruises are slated to call in the first quarter of 2015. Situated within the Bay of Trujillo, Banana Coast has a natural, deep-water harbor that provides protection from winds and waves. Christopher Columbus landed there more than 500 years ago during his last voyage to the Americas. Since then, the area has been a Spanish colony and was at various times controlled by the Dutch, French, English — and pirates. During the early 20th century it was the banana export capital of the world.